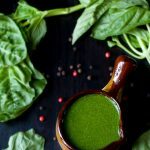 This basil peppercorn vinaigrette is the perfect way to welcome spring! Basil. Bright green, fresh, sweet and fragrant. It’s a smell that reminds me of both spring and summer; of my unruly garden; of pesto pasta with a glass of white wine. I’m not sure that I could ever pick just one fresh herb to call my favorite but I certainly gravitate toward basil quite a bit. This vinaigrette is inspired by a restaurant that I worked at several years ago. The owners were in charge of a series of shops including a small local grocery store on the same block. There was never a concern about not having fresh produce available right when we needed it, which was was quite a luxury compared to some of the other places I worked. 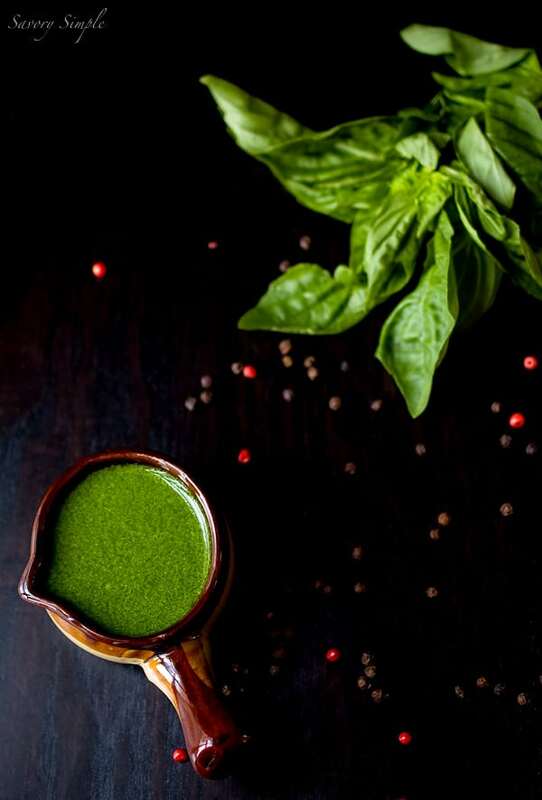 It allowed us to use fresh herbs daily to create inspired dressings and coulis. The key to making this vinaigrette is blanching the basil. 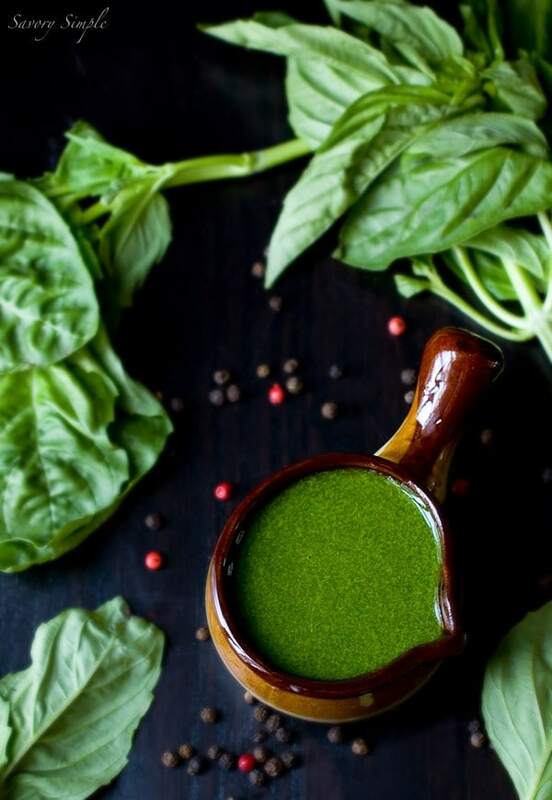 Basil will turn brown very quickly once it’s cut and blanching it preserves that beautiful bright green color for a vinaigrette that will elevate even the most basic salad. Bring a medium sized pot of water to a boil. Fill a medium sized bowl with ice water. Add basil to the boiling water, making sure to push it down so that it blanches evenly. 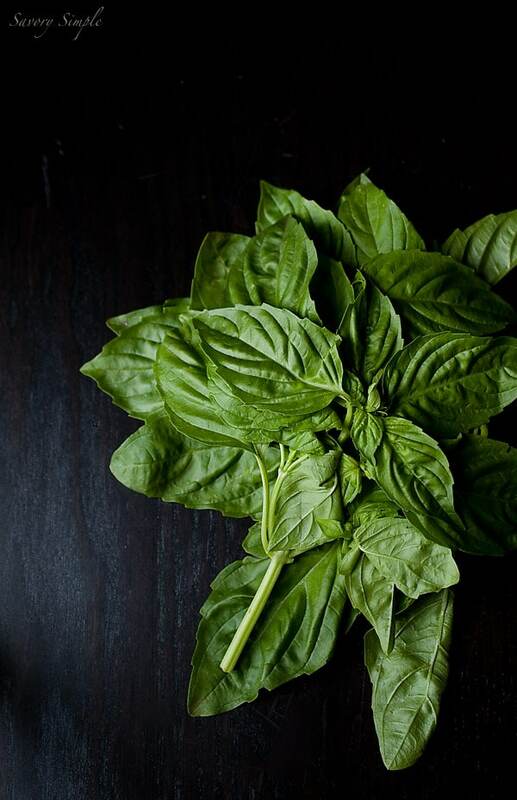 After 15 seconds, scoop out the wilted basil and add it to the ice water to halt the cooking process. Once cold, user paper towels to try to squeeze out as much water as possible. Place the basil, olive oil, vinegars, lemon juice, garlic, salt and pepper into a blender and puree on high speed until smooth. What a s-t-u-n-n-e-r, Jen!!! Wow, just totally smitten with this vibrant and bright vinaigrette!!!! Stunning! I could eat it with a spoon! Jen, this vinaigrette sounds divine. I love fresh basil. For me, it signifies summer. Love this! I’ve been so obsessed recently with cilantro that I’ve been totally neglecting other herbs. Especially basil! My Italian family would be so disappointed. Divine! Love Basil this time of the year!! this looks AMAZING – how long do you suppose it would keep in the fridge? A few days, I would imagine. I’m not entirely sure because we always use it up pretty quickly! Beautiful salad dressing! The color is so vibrant! Pinned! I just planted a slew of basil in my garden. I hope I end up with a bumper crop so I can make this!